One of the most popular horses on campus never makes a sound. You can’t ride her, and she won’t trot or jump or gallop. You can’t bathe her, though she’s always impeccably groomed. You can’t feed her; she won’t eat. But you can take her apart and put her back together again — over and over. Her name is Ms. Faux. Everything about her looks real and nothing is. 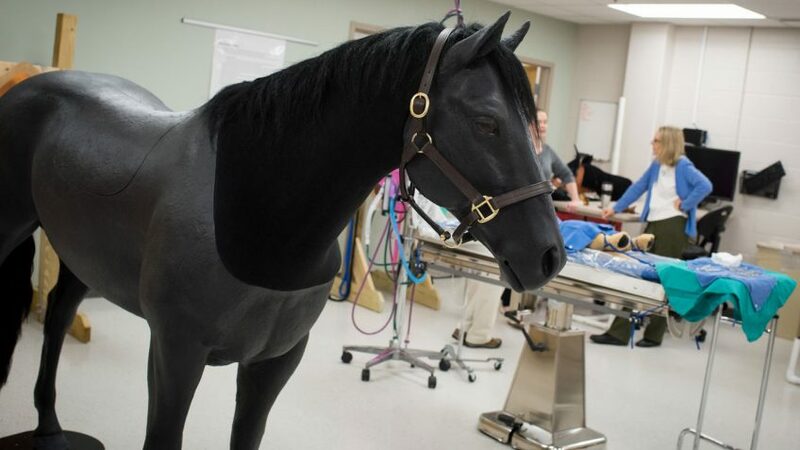 She’s one of the stars of the Simulation Lab at the NC State College of Veterinary Medicine. She used to live in a large classroom — sometimes in the hallway — in the Veterinary Health and Wellness Center, not far from where her living, breathing equine brethren are housed. Now, she has moved into the barn at the Teaching Animal Unit, even closer to real horses. Stare into her eyes and you half-expect her to blink. Her hide feels remarkably real, but her body is an epoxy/fiberglass blend over a steel frame. Inside Ms. Faux is a five-section GI tract, an anatomically correct colon, three sets of interchangeable ovaries, a spleen and kidneys, all made from combinations of latex, silicone, vinyl or plastic. Her neck can be injected with needles and colic can be simulated. 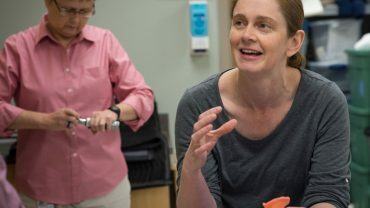 Semester after semester Ms. Faux and dozens of her fellow SimLab models provide students something they both need and want — to practice, practice, practice. And then practice some more. Many of those models are DIY, designed and crafted by Taylor and Druley and covering everything from halter placement to hand tie suturing, ear and eye exams and spaying. There’s models that even help students identify different sizes of organs or to learn, as all veterinarians must, to “see” with your hands during many surgeries. Skill focuses progress as the students do. First years may just practice suturing, but come their second year, they’ll move on to intubation and spaying and more. The formal aspect of the SimLab comes in week-long classes during “selectives,” held each semester between the end of classes and a holiday break where students sign up for an intensive class focusing on a particular specialized field or skill. But the power of SimLab comes during the rest of the year. 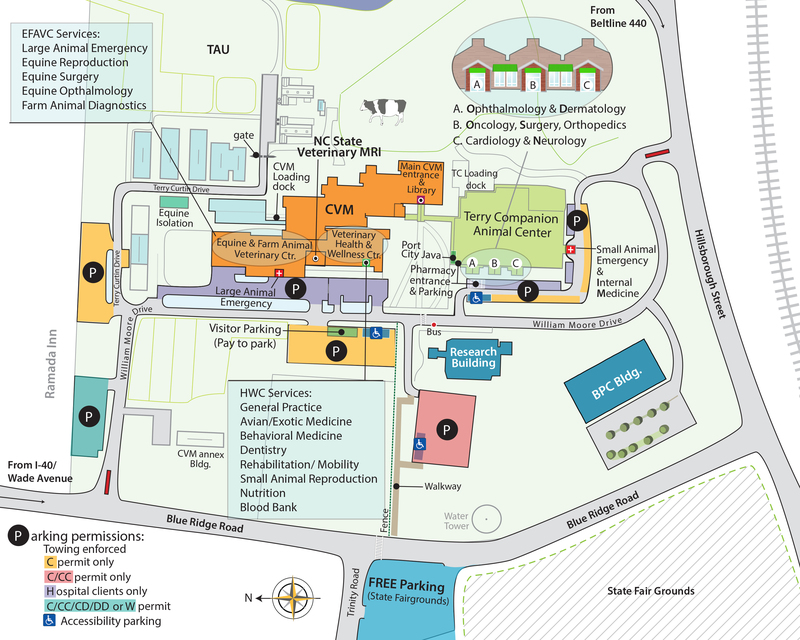 Though most popular with first and second years, the lab is open to all CVM students for drop-in sessions or to check out a particular model to practice on at home. That’s Druley’s cell phone number on the whiteboard outside of the SimLab room. All a student needs to do is text or call. A variety of informal skill self-tests are available at the SimLab at any given time. 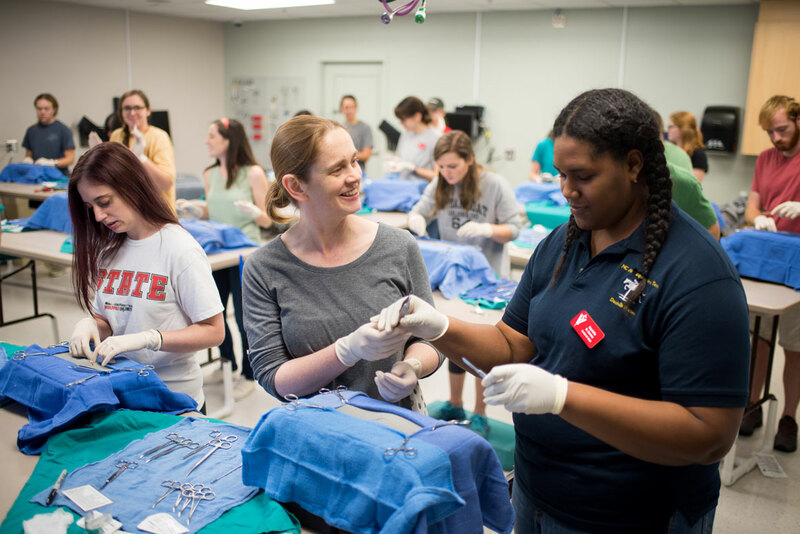 During the week, a first-year student could be in the room practicing suturing while another tries out an anesthesia machine or perfects venipunctures on the lifelike veins of model horseheads. There’s also the basics. Several models are geared toward fine-tuning motor skills and to discover the proper way to handle instruments. The benefit of a particular flick of a wrist or an effective rotation of a hand holding a scalpel is difficult to teach via textbooks. In the SimLab, mastering finger placements and grips and posture is part of your growth as a veterinarian before you cut into fake flesh and sew it up. During selective sessions, students often watch videos narrated by Taylor, who then stops at various parts and goes over the steps in person, walking around the room and stopping to assist students as needed. It’s like watching Julia Child on TV go over the proper way to cook a roast and at the same time having her in your kitchen to make sure you don’t overdo it on the salt. Almost all of Taylor’s model ideas come from what she’s teaching and what she notices students need more practice with. Taylor, who joined the CVM’s surgical teaching team in 2013, constantly revisits the steps of instructions for procedures to reflect new techniques or if students find certain points confusing. She looks up models online, both large models sold by companies and smaller models developed by veterinarians at school around the world, with the goal of growing and perfecting CVM’s SimLab’s offerings. Despite Taylor’s vast veterinary experience — she’s been in small animal practice in the U.S. and her native United Kingdom, as well as in private practice and for the U.S. Army in South Korea, she deeply understands the importance of repeated practice. When she took a 10-week maternity leave a few years back, she found herself at home practicing suturing. Feeling nervous about surgery is normal, said Taylor. Those emotions don’t need to consume you and after SimLab they most likely won’t. The offbeat forward-thinking and devotional effort put into SimLab pays off. It’s a popular selective option each semester. Its benefits are often spread via word of mouth from student to student. 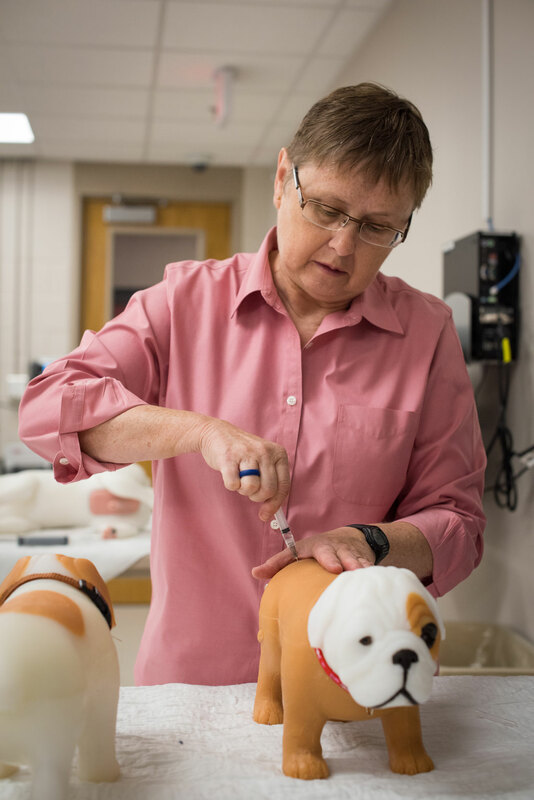 Between December 2015 and September 2016, during formal selective sessions and voluntary labs, about 90 students practiced simulated spays, said Taylor. Amanda Hanley, a first-year student with a small animal focus, devotes an hour each week to SimLab, between 8 a.m. and 9 a.m. on Fridays before classes begin. Second-year student Abby Crownshaw sees similar benefits. She’s spent hours practicing on one of the spay simulation boxes, plastic boxes covered with “skin,” with a balloon standing in for a uterus and different colors of rubber bands for different arteries and ligaments. Taylor based her SimSpay on a model used at the University of Copenhagen’s vet school. “Going into your first surgery on a live animal is nerve-wracking, so to be able to practice the mechanics of it beforehand settles those nerves,” said Crownshaw. “I know going into my first spay I was worried. I also know I was in here practicing again and again. The life-size Ms. Faux is a dramatic teaching tool for the SimLab, but mastering the basics is the heart of SimLab. Which is why, during an early morning session in late November, a group of 20 students were staring intently at a small plastic shoebox that is a simulated spay. There was even some work to get to that point. Students practice placing towels on their surgery space. They go over the different types of towel clamps and review names of instruments before they get their hands on them. And when they do pick up a scalpel, that’s also only the beginning. Various tips and tricks of the trade are rapidly imparted to students as they begin watching the training video. Then, after pausing the video, Taylor’s warm yet firm voice comes through loud and clear. “OK, you ready to spay?” she says from the front of the room. The students make a cut they’re told should be firm and bold. The step-by-step video, narrated by Taylor, plays at the front of the room as Taylor stops at multiple points to check on all of their students. Afterward, the students cut through a fabric designed to feel just like skin. Some students appear confident, others are nervous. Taylor and Druley have seen all these reactions before and know just what to say and do to help. No student is embarrassed; no one is shamed. Everyone is comfortable. “We have some good 5-centimeter incisions here and we have some … overly enthusiastic 5 centimeters here,” says Taylor. 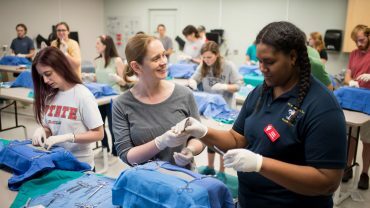 Many students enter the CVM eager to not only learn about the best surgery techniques — they want to feel like surgeons right away. The SimLab gives them that experience. But, more importantly, it helps them develop into the skilled surgeons they know they can be.